Geocaching Container Types Get an idea of what type of container to look for when hunting a cache before you head out the door! Austin Geocaching In The Media The Geocaching In The News page now includes an excellent KABB TV news story featuring team cpnowak that aired on October 13, 2006. Geocaching Terms What do all of those terms and abbreviations mean in cache logs? 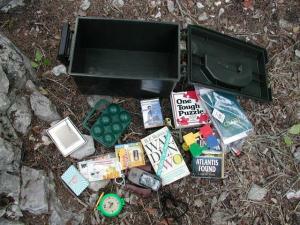 Find out what's really being said in our list of Geocaching terms. Geocaching on San Antonio TV Moosiegirl, The Outlaw and TreyB do a fine job representing geocaching, but this San Antonio TV station manages to put a weird spin on it concerning addiction! The ultimate global game revealed! The Complete Idiot's Guide(r) to Geocaching, Second Edition is a comprehensive, yet entertaining and easy-to-understand book for getting started and having fun with geocaching-the high-tech version of hide-and-seek for global positioning system (GPS) users. In this edition, two new tools of the game-Waymarking and Wherigo-are included.